Click here to find a set of brake rotors for your vehicle. When driving a vehicle, most would agree that the gas pedal is the most fun place to set your foot. However, a heavy right foot wouldn’t be all that great if you couldn’t scrub off the speed with a good set of brakes. One of the main components of the braking system are the brake rotors, and after the brake pads they are the second most commonly inspected and replaced parts of the system. As such, it’s important to select a good set of rotors that will be both long lasting and perform well to reduce long term maintenance costs while enjoying great stopping power. The rotors work in conjunction with the brake pads to slow your vehicle when you apply pressure to the brake pedal. When you step on the brake pedal, the hydraulic pressure that you create in your brake lines via the brake master cylinder forces the brake pads against the brake rotor, creating friction. This friction slows the rotation of the brake rotors, which are mechanically connected to (and thus rotate at the same speed as) your car’s wheels. Accordingly, as you slow the rotation of your brake rotors, you also slow the rotation of your car’s wheels and thus slow the car down. Because brake rotors are subjected to significant friction, they also encounter a lot of heat. Another function of the brake rotors is to help dissipate this heat efficiently to prevent damage or warpage to the brake components. Additionally, this prevents a phenomenon called brake fade, which means that the brake system has heated to a temperature that is outside the operating range of the brake pad material, which reduces braking performance until the brake system cools (avoiding this phenomenon is why it is often advised not to ride the brakes constantly when driving down long hills). This is accomplished in a number of ways, but the most common is using vents around the circumference the rotors. They are most common on front brakes, which are rarely just solid metal (although the rears tend to not have vents on occasion due to the fact that they do less of the braking work). Other strategies to help dissipate heat include using slots, holes, or grooves on the friction surface. Rotors with these features are often called slotted rotors or cross-drilled rotors, which are considered a performance advantage versus solid rotors. Vibration/Chatter – Vibration when braking can usually be felt through the steering wheel when the front rotors are affected and felt in the seat when the rear rotors are affected. Most commonly, this is the result of rotors that have become warped after being overheated. Cracks in the Rotor Surface – As rotors age and become thinner over time, they become less efficient at dissipating heat. That heat can cause stress cracks on the rotor surface, and the cracks will continue to grow over time with each successive heat cycle. Cracked rotors should not be driven and should be replaced immediately as they represent a significant safety concern. Brake Rotor is Too Thin – Each rotor manufacturer specifies a minimum thickness for their rotors. Each time you brake, you remove very small amounts of material from both your brake pad and your brake rotor. Over time, this material removal adds up and slowly reduces the thickness of your rotors. When the rotor thickness reaches the minimum, it’s time to replace them. When you’ve determined that your rotors need replacement, it’s time to swap them out! Changing rotors is relatively straightforward and requires mostly common tools. Since the work is almost identical, this is also a good time to change out your brake pads if they need replacement. Before you start, it is recommended that you wear eye protection as well as a set of sturdy mechanic’s working gloves to protect your hands. Step 1 – You will need to lift the vehicle off the ground in order to remove the wheels and tires using either a floor jack or car ramps. Use jack stands to safely support the vehicle. Loosen the lug nuts slightly (but not all the way) before lifting the vehicle with your lug wrench, and once it’s in the air you can remove the wheels and tires completely. Step 2 – Next you will want to remove the brake calipers from the rotors while keeping the brake lines connected. The calipers are usually held in place with 2 bolts that you can remove from the backside of the caliper with a socket & ratchet set. You may also need a small extension depending on your vehicle and you should be aware that sometimes the bolts require hex keys or torx bits to remove. When the calipers have been removed, hang them to the side with some wire or string so that it does not put tension on the brake hose to avoid potential damage and leaks. It’s worth noting that the parking brake on the rear brakes may add a few extra steps depending on vehicle. Step 3 – When the calipers have been removed, the next to come off will be the rotors themselves. Depending on your vehicle, it may simply slip off the hub without needing to remove any more fasteners or parts. In some cases, the rotor will have a retention screw (usually torx) that will need to be removed. Step 4 – When the new rotors are ready to go back on the vehicle, you first want to make sure any contaminants on the surface have been cleaned away. A simple spray with brake cleaner and a wipe with a clean shop towel will remove any contaminants. Step 5 – Now it’s time to put the new rotors back on the vehicle. Installation is done in reverse order of removal. Make sure to torque all fasteners to factory spec using a torque wrench. You can find the appropriate torque specs in the factory service manual or in a repair manual such as Chilton or Haynes. Use thread locker only if recommended by the manufacturer. Step 6 – The new rotors will be thicker than the old rotors, so you’ll need to use a caliper wind back tool or similar to push the caliper piston back into the caliper body to accommodate the increased thickness (pop the brake pads out first so you don’t damage them and put them back in after). You should also pop the master cylinder cap and monitor your brake fluid level as you will notice it rise as you push the caliper pistons back into the calipers. Once you have created enough space, reinstall the calipers by following the removal steps in reverse order. Only use thread locker if the vehicle manufacturer specifies it. Make sure to torque all fasteners to spec with a torque wrench. Also, reinstall the cap onto your master cylinder if you removed it. Step 7 – With the brake system back together, it’s time to reinstall the wheels and tires, put the car on the ground, and torque the lug nuts to spec. Step 8– Before you start driving, pump the brakes a few times and then check the brake fluid level to ensure that you are above the minimum level and below the maximum level. Add or remove brake fluid to the reservoir as necessary. Be careful when using brake fluid as it can easily damage car paint if you spill. Step 9 – Confirm that the brake system is operational and feels normal prior to driving. The pedal should feel firm and precise. If you feel a spongy brake pedal, it means you likely have allowed air into your brake system and it needs to be bled using a brake system bleeder kit before driving. When it comes to selecting replacement brake rotors for your car, there are many brands out there and the decision can be tough. To simplify your life, we have recommended the brands that we have had good luck with over the years. Brembo is an Italian based company that you most likely recognize from high-level motorsports such as Formula 1. They supply to many of the OEM European supercar manufacturers, and that high quality and attention to detail is passed down to their replacement parts for your everyday driver. They make factory rotors for a wide variety of cars, as well as big brake kits for high performance and racing applications. Their quality is consistently good and you can’t go wrong as they are typically reasonably priced. Click here to find a set of Brembo brake rotors for your vehicle. StopTech is well known for providing high quality braking components and systems. 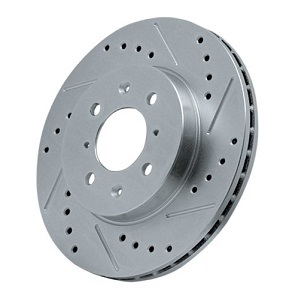 They produce a variety of OEM spec and performance brake rotors including cross drilled and slotted versions. They are a great supplier who makes both fantastic brake rotors as well as brake pads. Their brake components are approachable from a pricing standpoint, and the value for the money is high considering the quality. Overall they have satisfied us over the years and we think you will be equally as happy with a set of StopTechs. Click here to find a set of StopTech brake rotors for your vehicle. Powerstop is a company that has quickly gained popularity with the aftermarket crowd. They make rotors and pads for most vehicles, and tend to make them to high standards from a quality standpoint. They are readily available and very cost effective. Like the other brands listed here, they are also in the performance braking game with cross drilled and slotted rotor options available if you are an aggressive driver who wants a little extra heat dissipation at your disposal. Overall, Powerstop is a good place to spend your money if you need a brake replacement since they won’t break the bank and you’ll get good parts. Click here to find a set of Powerstop brake rotors for your vehicle. EBC Brakes is well known for their brake pads, so the logic would follow that their rotors are just as good. Fortunately, we can confirm this fact. EBC makes a variety of different brake pad options ranging from long lasting economy versions to extremely high performance track pads that require warm up to properly function. Their pads pair nicely with their rotors, which can be had in cross drilled configurations if you so choose. Overall we have had great experiences with EBC and give them a strong recommendation for both pads and rotors. Click here to find a set of EBC brake rotors for your vehicle.